At the cinema: reduced members-only prices apply. On presentation of this card and identification at the customer service center (B2 level) of the eslite spectrum songyan store, you may directly apply for an eslite membership card. No consumption or forms needed. Foreign guests please present their passport. Each person can only apply twice. 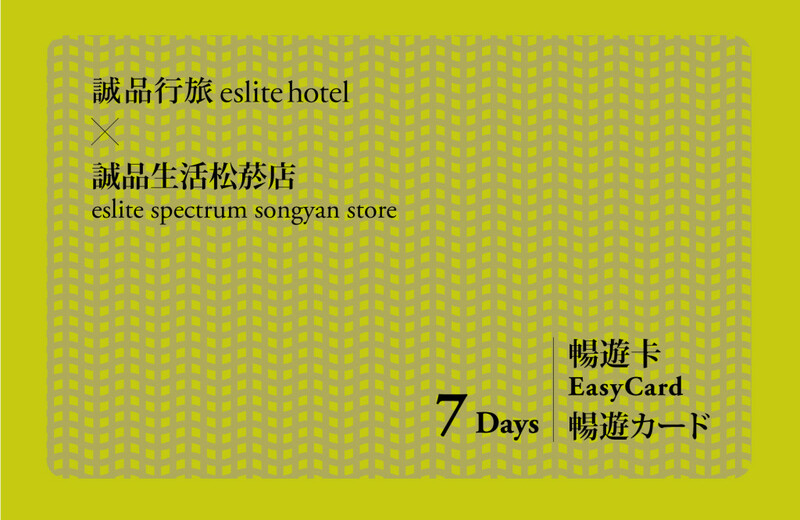 This card is limited to use in the eslite spectrum songyan store in Taiwan. On presentation of this card, you can enjoy members-only price reductions and special offers in the bookstore and boutiques. Special offers cannot be given on eslite gift certificates, reduced-price products, and products that cannot be reduced in price. The boutiques within the store each have their own special offer rules available for reference on site. Price reductions or special offers cannot be given in addition to the membership card. This card cannot be used in stores other than the eslite spectrum songyan store. This card is valid indefinitely. For the validity period, please refer to the information shown on the inner pages. In the event of loss, the card will not be reissued. eslite reserves the right to alter the rights and interests associated with the card at any time. Matters not accounted for in these rules are governed by the on-site announcements at the eslite spectrum songyan store/eslite hotel or the eslite website. 유효한 신분증을 소지하고 카드 소지자 본인이 에스라이트 스펙트럼 쑹옌점 B2 고객서비스센터 방문 시, 별도의 구매나 신청서 작성 필요 없이 현장에서 에스라이트 회원카드 발급. 타이완 국적이 아닌 외국인 투숙객이 신청 시 여권 원본을 소지해야 하며, 신청 횟수는 1인당 1회로 제한됨. 본 카드는 타이완 에스라이트 스펙트럼 쑹옌점 전관에 한해서만 사용 가능하며, 카드를 제시해 서점 및 전문 매장에서 회원가 할인 혜택을 받을 수 있습니다. 에스라이트 상품권, 특가상품 및 할인불가 상품에는 할인 혜택이 적용되지 않습니다. 에스라이트 스펙트럼 내 전문 매장에서의 할인은 각 현장을 기준으로 합니다. 본 카드는 에스라이트 회원카드의 할인 또는 우대 혜택과 중복해 사용할 수 없습니다. 본 카드는 에스라이트 스펙트럼 쑹옌점 이외의 다른 매장에서는 사용이 불가합니다. 본 카드는 유효 기간이 없습니다. 사용 기한은 내부 페이지의 표시를 참조해 주십시오. 분실 시 재발급되지 않습니다.